Hawkins Pools specializes in complete BBQs and Outdoor Kitchens construction with high quality design solutions for your home. Browse through our completed BBQ & Outdoor Kitchen projects. An outdoor kitchen with BBQ allows you to expand the living space where you can cook and entertain friends and families right at your own backyard, especially during summer. It is important that you have an experienced and reliable contractor to have a well designed outdoor kitchen and BBQ that will allow you to enjoy the space beyond summer. Incorporating interior kitchen ideas to your outdoor setting is a great way to add versatility and value to your home. 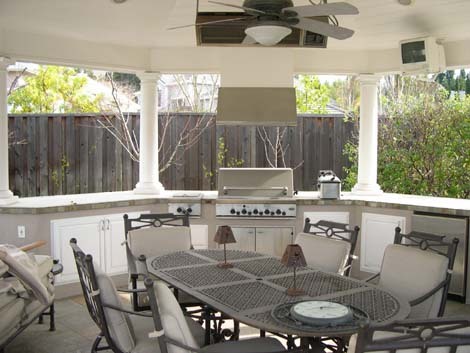 A good design would make your outdoor kitchen as functional as indoor kitchen. With proper pavilion-style design it can be as welcoming as a living room, and as entertaining as a family room. Selecting a professional contractor that can help you design and build your dream outdoor living space is very important. A reliable contractor with design experience can bring ideas for different types of outdoor BBQ, kitchens and other design for the surrounding living space. Call Hawkins Pools for outdoor kitchen design consultation and construction.